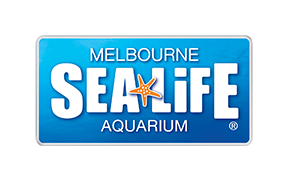 Journey back in time and meet the pre-historic giants of the ocean at the latest, must-see summer experience launching at SEA LIFE Melbourne. This interactive exhibit will takes visitors on an adventure to discover more about the magnificent ancient creatures of the sea and get up close to some remarkable animals that have lived for millions of years. Come face-to-face with the living history of the oceans including mysterious Mudskippers, extraordinary Epaulette Sharks and phenomenal Pig-nosed Turtles. Enter the magnificent underwater caves of these incredible creatures and be submerged into the ancient seas. The new display features immersive lighting projections creating animal silhouettes teamed with sub-aquatic animal sounds, and an awe-inspiring display featuring jaws of the pre-historic Megladon, the largest predator to have ever existed. Junior explorers will also receive a map to guide them through the exhibit to hunt for clues and collect stamps as they learn fascinating facts about the ancient oceans that they can share with family and friends. Children can also dig for ancestor fossils in a sandpit station.